Faculty members have been contributing to the current debate on political reform after the Occupy protests. The government launched the second round of public consultation on political reform on 7 January 2015. 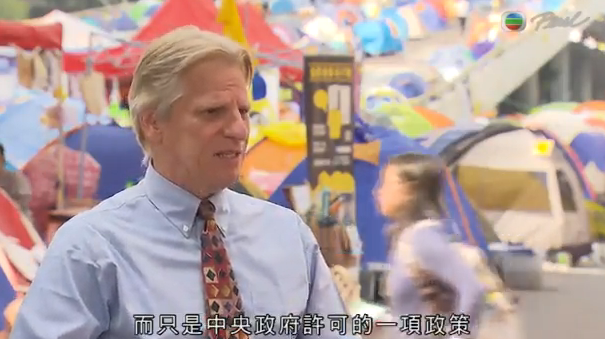 Michael Davis (left) was interviewed on "Law and Disorder" on the TVB programme, The Pearl Report, broadcasted on 12 January 2015. Albert Chen has been active in the media advocating his "None of the Above" (NOTA) proposal. His writings (in Chinese) have been featured on the Orange News website on 5 and 8 January 2015. He was recently interviewed on the RTHK television programme, The Pulse, with legislator Ronny Tong. On 13 January 2015, the South China Morning Post published a full-page story on the people's right to veto all candidates featuring the proposals of Albert Chen and Simon Young.